This collaborative approach instills confidence in novice researchers, prepares more experienced nurses for future leadership, and expands the reach of established experts. To develop confidence among novice nurses in nursing research and evidence-based practice, identifying students and staff with similar project interests who can work collaboratively helps to support project development and completion. Near-peer mentored projects begin with an idea that’s developed into a plan incorporating the skills and knowledge of the near-peer and the novice overseen by an expert. The strength of the near-peer model rests on the theoretical constructs of social congruence (individuals in a shared social setting who have similar experiences) and cognitive congruence (individuals with a similar knowledge base). Nursing has appropriately increased its focus on evidence-based practice (EBP), the development of new knowledge, and baccalaureate education as entry into clinical practice. Programs appear almost daily offering online education, courses to supplement existing knowledge, and continuing education for those who’ve completed their formal education. Clinical nurses are busier than ever with high-acuity patients, shorter hospital stays, staff shortages, and complex technology to master at the bedside. In addition, nurses at all experience levels need innovative strategies to help them conceptualize, design, and complete projects, especially when the American Nurses Credentialing Center (ANCC) Magnet Recognition Program® now requires documentation of two completed and one ongoing nursing research study in each hospital. The skills needed to conduct EBP projects are rarely taught in associate degree or diploma programs and may be minimally covered in baccalaureate curricula. The combination of limited knowledge, time, and mentors makes the completion of a capstone or dissertation-level project difficult for nurses who juggle heavy workloads, complex coursework, and family responsibilities. Identifying students and staff with similar project interests who can work collaboratively helps to support project development and completion. One way to do that is through near-peer mentoring. During the recent Magnet® site visit to our 525-bed quaternary care facility, one of the appraisers commented on the approach that we used to encourage research between two nurses who were students at the same university; one was completing her bachelor’s degree in nursing (BSN) and the other was completing her doctor of nursing practice (DNP). The situation presented us with an opportunity to test the near-peer mentoring model, which has been used in medical and pharmacy education. In this model, a more experienced student (near-peer) mentors the less experienced student (novice). Both students are guided by an expert who serves as a resource. In our case, a research expert facilitated the pairing of the two individuals after speaking with them independently about their compatible research interest. The novice applied what she learned in her didactic coursework and her clinical experience to the project while the near-peer mentor made the research process tangible and understandable as she worked on her DNP project. Frequent, regularly scheduled meetings between the two facilitated smooth, unhurried communication (the expert met with the team intermittently). Near-peer mentored projects begin with an idea that’s developed into a plan that incorporates the skills and knowledge of the near-peer and the novice. With the added support of the expert, all members of the team accrue benefits that can advance their careers and enhance patient care. And in an age of limited resources, the near-peer approach maximizes the expert’s impact and should result in more poster presentations and journal publications. Also, should one of the team members need to resign, the continuity of the project can be maintained more easily. Research projects can originate from a need identified by a unit practice council, a clinical nurse’s observation, or a question identified in the literature. The near-peer and novice develop the topic question into a plan for reviewing existing literature and determining next steps. Depending on the available evidence, the project may develop into an EBP project or it may require a nursing research proposal if insufficient evidence can be found in the literature. 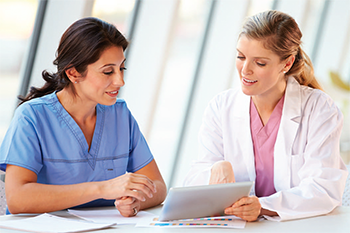 The near-peer mentoring model includes three members:the novice nurse, the near-peer mentor, and senior expert.Each member of the team benefits from this model. build confidence as beginning researchers, increasing the likelihood that they will participate in more projects. may develop an interest in teaching and joining nursing faculty, an area where shortages are predicted. gain access to up-to-date clinical information. The strength of the near-peer model rests on the theoretical construct of social congruence, where individuals in a shared social setting who have similar experiences are able to relate more easily than those who don’t share those experiences. In the hospital setting, a nurse completing his or her undergraduate degree while working in a clinical capacity can relate more easily to a peer who’s a higher-level student than she can to a faculty member or a senior expert. Additionally, cognitive congruence (similar knowledge base) enhances the likelihood of good communication, shared understanding, and a perception of being supported. Our success with this model was based on a shared project idea that benefitted from the clinical expertise of a staff nurse, who was completing a BSN degree and was a novice to the research process, paired with a DNP student who needed that clinical expertise to conduct her research. Working through the research process together made the project more meaningful and less intimidating for both. Each benefitted from what the other provided and together their project was a positive learning experience as well as a model of collaboration. The team graduated from their respective degree programs, presented their findings through posters and presentations, and look forward to developing more projects. Our organization is in the process of evaluating this model of near-peer mentoring in the hospital setting by developing a nursing research study using mixed methodology. Currently, we have an active nurse residency program with required EBP projects, several nursing staff who are BSN students, and many nurses pursuing graduate degrees. Our active nursing research/EBP council is composed of advanced practice nurses (several with doctoral preparation) and is chaired by a doctorally prepared research lead. These resources provide an ideal setting for testing this model. The authors work at Sentara Norfolk General Hospital in Norfolk, Virginia. Susan Mullen Kaplan is a nurse specialist and coordinator of nursing research and evidence-based practice. Tina Kennedy-Schlegel is a nurse anesthetist and patient care supervisor. Pamela Hammond-Miles is an I.V. team/midline inserter. Joanne Williams-Reed is the director of patient care services, education, wound services, diabetes, chaplaincy, AV, Telemetry, and eICU. Deal EN, Stranges PM, Maxwell WD, et al. The importance of research and scholarly activity in pharmacy training. Pharmacotherapy. 2016;36(12):e200-5. Evans DJ, Cuffe T. Near-peer teaching in anatomy: An approach for deeper learning. Anat Sci Educ. 2009;2(5):277-33. Irvine S, Williams B, McKenna L. Near-peer teaching in undergraduate nurse education: An integrative review. Nurse Educ Today. 2018;70:60-8. Lee BJ, Rhodes NJ, Scheetz MH, McLaughlin MM. Engaging pharmacy students in research through near-peer training. Am J Pharm Educ. 2017;81(9):6340. Legg TJ, Adelman D, Mueller D, Levitt C. Constructivist strategies in online distance education in nursing. J Nurs Educ. 2009;48(2):64-9. Lockspeiser TM, O’Sullivan P, Teherani, A, Muller J. Understanding the experience of being taught by peers: The value of social and cognitive congruence. Adv Health Sci Educ Theory Pract. 2008;13(3):361-72. Vaill AL, Testori PA. Orientation, mentoring and ongoing support: A three-tiered approach to online faculty development. Journal of Asynchronous Learning Networks. 2012;16(2):111-9.